Besides the beautiful scenery, amazing wildlife, challenging winds, cold weather and camaraderie, my favorite activity was visiting the "Old Florida" fish camps. We started at Middleton's on Blue Cypress Lake and ended at Jolly Gator Fish Camp at SR-46 in Geneva. In between we stopped at Camp Holly in Melbourne, Lone Cabbage in Cocoa and Airboats Rides at Midway in Christmas. Each one was a welcome respite with food, beverages, shelter and/or hospitality. The owners, staff and customers all share a love of Florida's waters. I hope in the future it won't be so unusual for a group of paddlers to come by these fun places. The 310-mile north-flowing St. Johns River’s headwaters are west of Vero Beach. We launched at Blue Cypress Lake in the upper basin marsh. The upper basin has many flow-through “lakes,” such as Hell ‘N Blazes, Little Sawgrass, Sawgrass, Washington, Winder and Poinsett, all quite large and challenging. Most nights we camped at one of the St. Johns River Water Management District’s campsites or other high ground along the river bank. After paddling across Puzzle Lake, we arrived in time for lunch at Jolly Gator Fish Camp. Now we’re ready for the next 100 miles of the mighty St. Johns River. We used these resources for planning: the St. Johns River Alliance website (naturally), St. Johns River Water Management District website, and Google Earth. In addition to the usual camping and kayaking gear, paddlers should mount a red pennant high on their kayaks for visibility. GPS devices are also necessary since the river channel is often hidden among the tall grasses. A longer version of this story and more photographs are available on the St. Johns River Alliance website and there is a You Tube video about the trip. The Department of Environmental Protection's Office of Greenways and Trails, will accept applications for land acquisition funding under the Florida Greenways and Trails program between July 1, 2015, and August 31, 2015. The Program is funded through the sale of bonds authorized under the Florida Forever Act. At present, approximately $2 million is available for acquisition projects. Applicants must apply for and receive a “Certificate of Eligibility” prior to submittal of an application. Once eligible, an applicant must submit an original “Application for Acquisition of Land” to the Office of Greenways and Trails by August 31, 2015. The Plan, applications for the 2015 funding cycle, the required forms and a copy of the rule containing detailed program requisites are available on OGT's Acquisition Program webpage. You may also request copies by contacting Britney Moore at 850-245-3069; Britney.moore@dep.state.fl.us, or writing to the Office of Greenways and Trails at: Department of Environmental Protection, Office of Greenways and Trails, 3900 Commonwealth Blvd., MS 795, Tallahassee, FL 32399-3000. Applications must be received by close of business August 31, 2015. BRAG Dream Team at the White House on their 2014 tour. The Armstrong community, astride the Palatka-to-St. Augustine State Trail, has adopted bicycle touring as part of its economic development. In late July they will host completion of the first group ride across the four-state Gullah Geechee Cultural Heritage Corridor. The touring team of mostly middle school to college-aged students from Georgia and North Carolina will set out July 11 from Durham, North Carolina and end two weeks later in St. Augustine. The team will celebrate the defining culture of a coastal region once famous for rice farmed by enslaved Africans who were largely left on their own because of malarial conditions, and who thus retained much of their native languages and folkways. “De Paat to Freedum Tour,” or “Path to Freedom Tour,” is a collaboration between the BRAG (Bike Ride Across Georgia) Dream Team from Atlanta and Triangle Bikeworks’ Spoke’n Revolutions Youth Cycling from Chapel Hill, NC. The team of 15 students and 10 adult coaches will end its tour July 25. The riders will cycle 46 to 80 miles each day and visit landmark sites along their route, including American Beach in Nassau County. When they roll into St. Augustine after Armstrong, they will have travelled more than 700 miles. It’s in Wilmington, NC, that the team will begin tracing the 550-mile cultural heritage corridor. The tour is the first since August 2014, when the corridor’s governing commission formed a partnership with the East Coast Greenway Alliance that leads advocacy for a 2,900-mile biking and walking trail to connect Maine with Florida. The greenway overlaps the corridor through its four states. To get involved with the tour in Florida, contact Velo Fest Community Initiative. For live tour updates, follow the hashtag #freedumtour on Twitter and Instagram. Two new trips are featured in Paddle Florida’s line-up of offerings for the coming paddling season. The St. Johns History Paddle December 4-8 of this year will allow paddlers to follow in the wake of 18th-century naturalist William Bartram. Historical sites and springs will be explored along 55 miles of the St. Johns River in Putnam County. The area is also known for its bird life and manatees. The Great Calusa Blueway in southwest Florida is featured February 13-19, 2016. This trip includes 57 miles of Lee County’s rivers, bays, creeks, mangrove tunnels and islands, including Cayo Costa State Park. Sea kayaks are recommended for this trip since some open water will be experienced. Other Paddle Florida trips include the popular Suwannee River Wilderness Trail October 22-27 of this year, The Florida Keys Challenge January 15-22, 2016, the Dam to the Bay on the Ochlockonee March 12-18, 2016, and topped off with the Suwannee River Paddling Festival April 1-3, 2016. Trips with the non-profit Paddle Florida group include catered meals, gear and boat shuttles, educational speakers and evening entertainment. National leaders in bicycling, walking, transit and trails will call for green mobility solutions to South Florida’s crippling road congestion this November 11-15 in South Miami. Their push will include restoring the memory of Kirk Munroe, who in 1880 co-founded today’s League of American Bicyclists (LAB) and for 30 years lived and bicycled around Coconut Grove. “Transit and bikeways, networked together, will be the most exciting, brand-setting part of our region’s next-generation infrastructure,” said Victor Dover of Dover, Kohl & Partners, who chairs the November program called WHEELS. 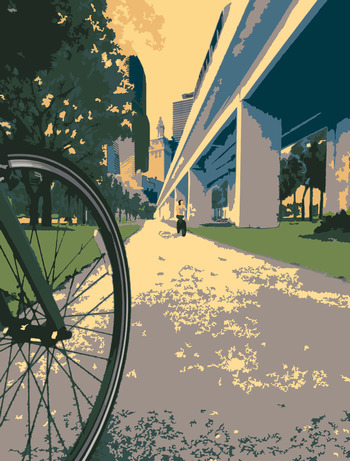 Presenting sponsors include the Florida Department of Transportation and the East Coast Greenway Alliance (ECGA), which will hold its 24th annual Membership Summit as part of WHEELS. “Over five days, we want 10,000 people to experience a bike-walk-transit-trail interface that by video, mentoring and in real time will help them at least consider giving up their cars for some days a week and how that can improve not just their personal health and household economy, but also our civic realm – how we all live together,” Dover said. WHEELS presenters will include Dan Burden of Walkable Communities and Blue Zones; Andy Clarke of League of American Bicyclists; Ryan Gravel, who initiated the Atlanta Beltline that includes strong private sector leadership in a $2.2 billion re-focus of that city’s transportation mix, ECGA’s Dennis Markatos-Soriano, and Dale Allen of the Florida Greenways and Trails Foundation. WHEELS will include five days of rides organized by Bike 305 and the Everglades Bicycle Club, a bike-in street party, and positioning Miami as a hub of trails. These include a rail-with-trail as part of All Aboard Florida, the Underline that will turn Miami’s M-Path into an 11-mile civic space, the Miami River Greenway and Ludlam Trail, the South Dade Trail, Plan Z for the Rickenbacker Causeway, and the East Coast Greenway through South Florida beach towns. Everyone with a bike during WHEELS will ride Tri-Rail free. The street party and conference are also free, but the conference will require pre-registration on the WHEELS website. Herb Hiller is the Florida coordinator for the East Coast Greenway Alliance. Last October, Bike Florida and the Florida Bicycle Association presented him with the 2014 Share the Road Visionary Award "for his pioneering work in helping make bicycle tourism a popular and economically vital industry in Florida." Few things in life are more memorable than our first trip floating down the shady corridor of a twisting river or skimming along a sunny coastline. Many of us equate our first significant experience in the outdoors with the first time we dipped a paddle, hoisted a sail or connected with flowing water as children. And we feel gratitude towards those who led us there and helped kindle a life-long relationship with nature. Many of us who are fortunate to have had these experiences feel a need to reach out and share similar opportunities for younger generations. Volunteer paddlers in Florida are making this happen through an exciting new Paddlesport Program that partners with the award-winning state park system. Author Richard Louv in his book, Last Child in the Woods, identifies what he calls “nature deficit disorder,” a term he coined to describe recent generations not having had opportunities to bond with the natural world. In its place, many children spend up to 8 hours a day using digital media and miss the therapeutic benefits of immersion in a non-digital green space. This lack of outdoor time has been linked to rising obesity, attention deficit disorders, and increased depression among youth. 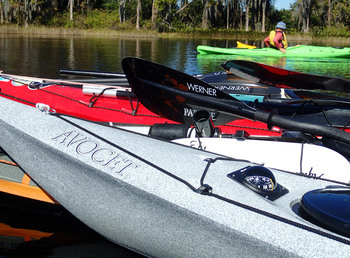 Florida’s Paddlesport Program seeks to turn this trend around by providing experiences to ignite connections to the outdoors with anyone, especially families with children. This is the mission behind the volunteer Paddlesport Program’s goal of training volunteers who, in turn, teach basic paddling skills and then lead on–the-water nature tours. These events take place within Florida’s state parks and public lands to highlight wildlife, habitat, and points-of-interest on diverse waterways. Volunteer paddlers attend 16 hours of intense instruction with expert American Canoe Association (ACA) instructors who donate their time to coach attendees through the rigorous ACA Coastal Day Trip Leader course. This course focuses on risk assessment and group management, an excellent fit for creating future generations of safe paddlers. The training takes place twice a year in April and November at Lake Louisa State Park near Orlando with a limited class size. Interested in sharing your passion for paddling Florida’s outstanding waterways with future paddlers? Contact Liz Sparks, Office of Greenways & Trails Paddling Trails Coordinator at liz.sparks@dep.state.fl.us . *Kaiser Family Foundation, Generation M2: Media in the Lives of 8- to 18-Year-Olds, 2010. As an avid kayaker I am on the water almost every day. In fact, one of the major reasons I chose to live in north Florida is the abundance of access points to public land and waterways. Since I am spending so much time in these beautiful places I often cross the paths of others who also enjoy the out of doors. Some of the people I encounter are ill prepared for this environment through a lack of knowledge and/or a lack of skills. This is especially true and especially dangerous when it comes to the people that I encounter on the water. 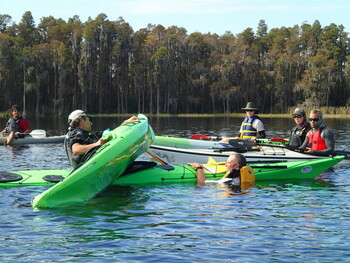 It is for this reason that, as an American Canoe Association certified kayak instructor, I offer free (with park admission) two-hour kayak safety and rescue workshops at Alfred B. Maclay Gardens State Park on Lake Hall in Tallahassee. Workshop participants are expected to bring their own kayak, paddle, and properly fitting life jacket. A few kayaks are available for rent at the main gate of the state park. Kayak rental should be reserved ahead of time with the park staff at (850) 487-4556. This workshop includes a discussion of the U.S. Coast Guard requirements. All vessels, including kayaks and canoes, are required to have onboard a properly fitting PFD (personal flotation device) for each person onboard and a sound-making device for a distress signal. For kayakers, this sound-making device usually means having a whistle attached to the PFD. While not required by law to wear the PFD, participants in this workshop will be required to wear the PFD while on the water. The workshop will also include and the proper outfitting of a kayak and suggested safety equipment such as internal flotation for the kayak and a way to empty the kayak of water should a capsize occur. It is suggested that participants come dressed for the weather and for immersion. Everyone will be given an opportunity to get wet and practice a kayak self and an assisted-rescue. These rescue practices include several techniques. Examples that are demonstrated in this workshop include how to swim the kayak ashore and how to effectively remove the water without hurting the paddler. Participants will also explore the techniques of to how to self-rescue and how to perform an assisted-rescue in open-water. The schedule of these workshops will be announced in the Tallahassee Democrat “Limelight” section or visit the Florida Kayak School’s web page calendar. For more information or to request the scheduling of a workshop call 850-445-3236.